NEW DELHI, India (CNN) -- Tensions eased in the northern Indian state of Punjab on Tuesday, following widespread violence across the region after a Sikh guru was shot to death and another was wounded at an Indian temple in Vienna, Austria. 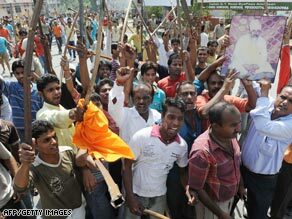 Sikh demonstrators brandish sticks as they shout slogans during a protest in Amritsar. The situation was tense, but under control, Punjab's inspector general of police said Tuesday morning. The army and federal security forces were called in to restore order, added inspector general Parag Jain. Thousands took part in demonstrations across the Doaba region, where protesters attacked public transportation, knocking out train service in some areas. They also blocked a national highway to Jammu, CNN sister network CNN-IBN reported. A number of businesses were ransacked as well. Police reported one death. Indian Prime Minister Manmohan Singh, himself a Sikh, appealed for calm, in a statement. "There is no place for violence in a secular society like India's and certainly no excuse whatsoever for the violation of the sacred premises of a (Sikh temple) for narrow sectarian or other purposes," India's Ministry of External Affairs said in a statement. Killed in Sunday's attack in Vienna was 57-year-old Sant Rama Nand. A second guru, Sant Niranjan Dass, 68, was seriously injured. His health has improved noticeably, according to the Indian Embassy, the Austria News Agency reported. Fifteen others were also wounded. "Sant Niranjan Dass is doing well," the embassy said. "He could soon be released from the hospital." Six people were arrested in connection with the attack, which occurred Sunday afternoon in Vienna's 15th district, police spokesman Schwaig Hofar told CNN. One suspect shot the two gurus, and five other attackers wielding knives assaulted people in the congregation during prayer, Hofar said. Four of the wounded were suspects, two of them in serious condition, he said. About 150 people were in the room when the violence took place, he said. Authorities are investigating what triggered the attacks, but Austrian Interior Minister Maria Fekter said Sikhs have lived "exceptionally peacefully" in Austria. CNN's Ben Brumfeld and Harmeet Shah Singh contributed to this report.